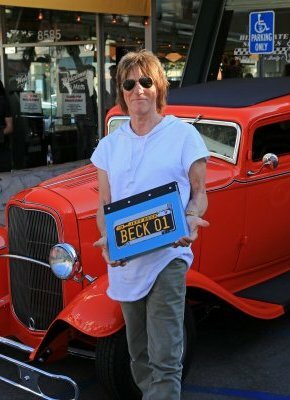 On 8th August, Mel's Drive-In, Los Angeles, was the venue for the launch of BECK01, Jeff Beck's new limited edition with Genesis Publications. The historic diner was the perfect choice for Genesis to host the evening, as it was the setting for American Graffiti, a film which has inspired a lifelong love of hot rods for Jeff Beck. The night was entitled "Hot Rods and Hamburgers", and was a VIP event including a book signing and sale, dinner, and a celebration of classic cars. Genesis subscribers attended from all across the US, with still more coming from as far as France, the Netherlands and Switzerland. Beck arrived in a 32 Deuce Coupe, and was joined by Candy Clark of American Graffiti. This is his latest stop on his summer of touring, making music with Rosie Bones and Carmen Vandenberg, performing his latest album, Loud Hailer. Jeff Beck will also be taking to the Hollywood Bowl for an evening of music, and then continuing on his tour. Photo: Tom Rejzek, Genesis subscriber since 1989.